On their best behavior at dinner; jealous lovers onstage. So last night, who comes in but a devoted Seattle Opera volunteer shepherding soprano Nuccia Focile and tenor Antonello Palombi (with wife & adorable kids). Since they weren't drinking anything alcoholic other than a glass of Prosecco, we didn't spend much time at their table. Took a while for the coin to drop, but then we overheard someone say "Pagliacci" and we said, yes, we were going to attend the Sunday matinee. Gee, we stammer, the Saturday opening night press tickets were all gone ...Maybe we can ask for tickets to your performance later in the run, we say in our halting Italian ... what do you think? Not Wednesday because we're short-staffed and we can't get away, but one of the others? We happened to have the laptop along and had just received an email from the opera's PR department with rehearsal photos and a link to the new video ... which they hadn't seen, so we show it to them and all ends well. 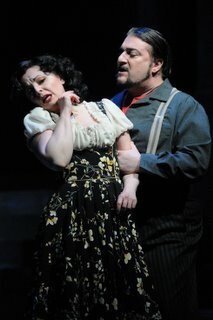 Unlike the opera, in which Antonello's character, Canio (as the hapless clown, Pagliacci) stabs Nuccia's character, his unfaithful wife, Nedda, in a jealous rage. They leave the restaurant in good spirits, with the high drama and the immortal curtain line ("La commedia è finita") still to come. Seattle Opera presents Pagliacci at McCaw Hall, Jan, 12-26. Tickets online or 206-389-7676. Let me see if I've got this right and please correct me if I am wrong. What a scoop, Ronald. Congrats. And you are papparizzi (sp) too. Very cool.